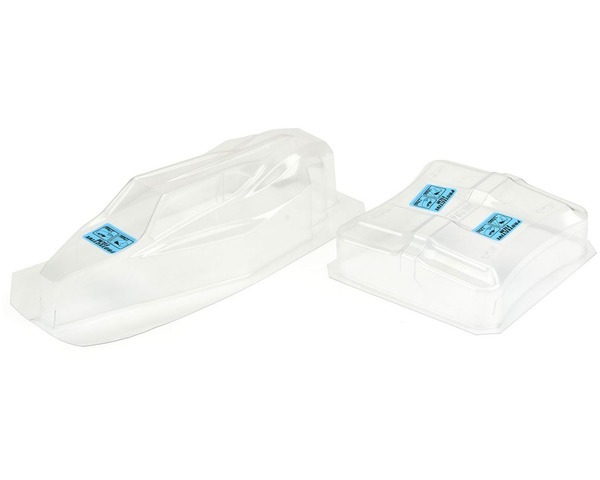 This is an Elite Light Weight Clear Body for Yokomo YZ-2. Introducing the all new Elite series of race bodies for 1:10 buggy, a clean-sheet design from Pro-Line bringing a fresh new look to the class. Designed with the latest in CAD technology, the Elite features an overall low-slung design with sweeping lines throughout giving it an unmistakable look on the track. A cab-forward design with rails extending up the hood and A-pillar provides enhanced steering feeling while a sloped center fin balances out the rear of the car with superior side-bite. The rear of the side pods feature outer ridges designed to lead air up to the included Air Force rear wing, maximizing rear grip. This body is a perfect fit on the YZ-2 buggy wrapping around the unique chassis shape. Proudly Made in the U. S. A, the Elite is available in both light weight and regular weights of genuine Lexan. Included with the body are two Air Force 6.5" rear wings, paint-then-peel overspray film, window masks and Pro-Line decals.